Spilled Salt: Bad Luck or Protection Against Dark Side? The exploration into the origins of common superstitions continues with spilling salt as a bad omen. While today we can buy salt by the sack load, salt was once a valuable commodity, and anyone recklessly spilling salt was wasteful and inviting future loss. Over the millennia, salt has been associated with purity, fertility, sexual desire and preservation, and in turn inspired many superstitious ties. Humans and animals need salt to survive, sodium prevents dehydration and is necessary for normal cell function, and salt was once our most sought after commodity. The word for ‘salary’ is derived from the word ‘salt’. 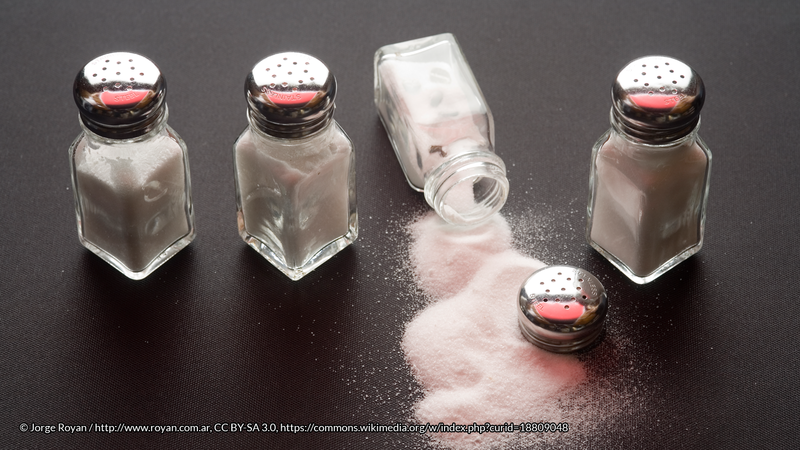 As well as being thriftless, any guest spilling salt was considered rude and seen as refusing hospitality, as featured in the German proverb ‘whoever spills salt arouses enmity’. Spilled salt is also an omen for broken friendships, as ‘every grain of salt will turn into a tear’. Spilled salt at dinner is an omen of a family row, and some say, it is not the person who spills the salt but the person closest to the spill who receives the bad luck. One well-known representation of spilled salt and a coming betrayal appears in Leonardo da Vinci’s The Last Supper, where Judas Iscariot is portrayed knocking over the salt cellar. Cures were developed to counteract the bad luck, most commonly, tossing spilled salt over your left shoulder. The salt is thrown on the left because this is where the Devil lives. Salt was considered godly and in comparison ‘the Devil loveth no salt in his meat’. It was used in many cultures to guard against evil spirits, because evil cannot abide salt. The Scots protected their butter churns from witches with a ring of salt, or tossed salt into the sea to blind the fairies. Medieval Roman Catholics placed salt on the tongues of newborns to protect them before baptism, and over the centuries, this practice was adapted and salt was placed inside the baby’s cradle. In Buddhism salt is used to purify a house from spirits. In Japan, salt is thrown on stage before a performance to banish evil spirits and Sumo wrestlers throw a handful into the ring to ward off invisible visitors. In Muslim cultures, salt deters the evil eye, and in Haiti, salt restores zombies. If your guest complains the food is too salty, beware, they may be a witch! For ancient Hebrews and moderns Jews, salt represents the covenant between God and Israel, and the Shulchan Arukh (The Set Table), a widely consulted book of Jewish laws, outlines that the two middle fingers can only be used to serve salt. If a man uses his thumb, his children will die, his little finger will bring poverty, or if he uses his thumb, he will become a murderer. But there are other ways to dispel the bad luck of spilled salt, other than tossing over your shoulder: you can toss the salt into the fire or stove. Or you can pour wine into your lap. Humans have had a long history with salt and its many practical applications for preserving and purifying have elevated salt into the realm of an almost magical substance. While we no longer highly value salt as a commodity, the memory of the use of salt to prevent evil still lingers in our culture today.